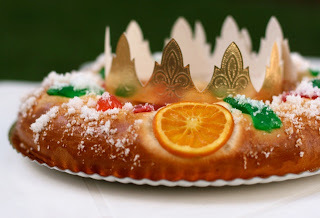 Tomorrow is 6th January and in Spain Epiphany is celebrated. Today the Three Wise Kings that according to the tradition found Jesus to honour him will make a parade for children in every city of Spain. And at night they will be visiting each children house to leave a gift (or carbón (really sweet imitating coal) to those children who did not behave good). At lunch time on 6th January is traditional to eat a cake with or without cream that hides a faba bean and a figurine. The one that will find the figurine will be the King or Queen of the Banquet and the one who finds the faba bean will have to pay for the Next Year's Roscón.